People with type 1 diabetes can’t produce enough insulin, a hormone that regulates the amount of glucose, or sugar, in our blood. So they must replenish their insulin stock either with multiple daily injections, or by pumping insulin through a tiny catheter. Unlike these manual techniques, Medtronic’s MiniMed 670G is a “hybrid closed system,” meaning it autonomously tracks glucose levels about every five minutes or so, and then adjusts insulin levels with little or no input from the user. “[MiniMed 670G] can provide people with type 1 diabetes greater freedom to live their lives without having to consistently and manually monitor baseline glucose levels and administer insulin,” the FDA’s Jeffrey Shuren said in a release. 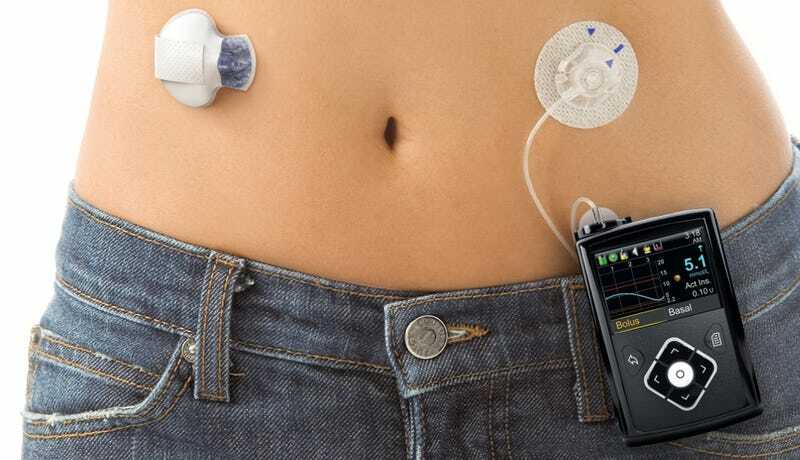 MiniMed 670G includes a sensor that attaches to the body to measure glucose levels under the skin, an insulin pump that’s strapped to the body, and a catheter that delivers the insulin. The insulin delivery site needs to be changed about twice a week. The device has been referred to as an “artificial pancreas,” but that’s probably not the best description. The device is not an internal organ, and it’s not completely autonomous. People with type 1 diabetes still need to track their carbohydrate intake, and then enter that information into the system. The FDA approved Medtronic’s MiniMed 670G following a successful clinical trial that included 123 participants with type 1 diabetes. During the course of the three-month trial, no serious or adverse effects—such as diabetic ketoacidosis (DKA) or severe hypoglycemia (low glucose levels—were reported. Medtronic, a medical tech firm based in Dublin, Ireland, says the device will be made available to the public in the spring of 2017. Looking ahead, the company plans to refine and further test the device in the hope that children under of the age of 14 can also use it.